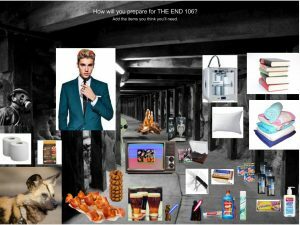 The End 106 – Where will you be for The End? This Week in The End. . .
Where will you be for The End? Dispatches from The End. . .
What a wild ride. Goodbye, The End. These past few weeks have been a whirlwind, I one-hundred percent cannot believe it’s already the end of the semester. Final Weekly Summary: it really is The End. Hello everybody. Today I am going to walk you through all of my work I did the past two weeks. This includes my Final Projects and my Daily Creates. To begin I’ll talk about my Daily Creates and I’ll finish with my Final Projects.